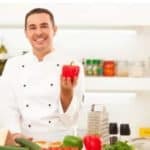 Being an owner of a small, modern restaurant with catering needs, I had long-term food storage requirement that a refrigerator simply couldn’t handle on its own! It is equally important to keep a balance while preserving foods for a longer time and keeping those fresh. So I looked for a solution and spent hours of research. Finally, I got the VacMaster VP215. Its chamber vacuum sealer fits my requirements perfectly! From long-lasting, fresh and scent-free packing and storage of everything I bought wholesale, to reliable seals, and stoppage-free usage, the VacMaster VP215 was a pro! I took the plunge, and WHAT a refreshing plunge it was! True to its word, the machine is super with my marinades and wet food, and equally great with fruits, vegetables, and powdered foods like coffee. It works tirelessly and super-fast, requiring zero cool-down time. EXTRAORDINARILY PROFESSIONAL! prefer a machine that works continuously and delivers enduring freshness for their products. If that’s your need, this vacuum packer will be your best choice! Rough and Tough Economizers: Users of high-end vacuum sealers know that reliability is super important for a machine. For a sealer this size, sending it back and forth for servicing is too time-consuming and cumbersome. Anyone looking for long-term savings in the form of premium, dependable storage support will jump for this! 1/4 HP rotary oil pump allows large loads of consistent sealing without stoppages for cooling the machine down between jobs. Double seals used on each bag make sure they last twice as long, without puncture or damage post sealing! Wet foods are packed particularly well by the VacMaster, owing to the chamber technology the unit uses. When you place the bag of liquid in the chamber, the air is sucked out of the whole compartment so that pressure remains the same in and out of the package. It keeps liquids inside the bag, resulting in neater seals. Easily operated, the VacMaster extends the shelf life of foods up to 5 times. It provides vacuum pressure of 29.7hg (higher than most of the sealer). As a result, certain fishes and meats can remain in the refrigerated pack for years, without odor or degradation. The removable 10-inch seal bar is so easy to clean, and the appliance is very fast, taking 20-40 seconds to complete any task- wet or dry! User-friendly interface with adjustable digital control panel and an easy read pressure indicator helps you manage everything about your packing. The body is made of stainless steel, weighs 84lbs and has dimensions (WxDxH): 14” x 20” x 15”. 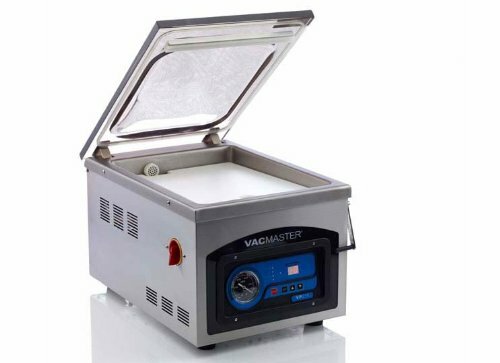 With 75 different sized chamber pouches, a pair of filler plates, a maintenance kit, and a manual, the VacMaster allows options for packing varying quantities of food with their customizable suction and sealing methods. The chamber size is (WxDxH): 11.25” x 15.25” x 5” and the largest convenient pouch, measures 10” x 13”. Oil pump eliminates cooling down time. The Higher compression level of 29.7hg. Easy to operate once set up. Remembers previous settings for faster repeat tasks. Customized packaging options/vacuum and heat levels/seal time/cooling time. Keeps food 5x fresher and scent-free. Strong BPA-free and FDA approved bags. The VacMaster seals 2-quart mason jars. You can place 3-quart jars inside the chamber comfortably, on their side, with the vacuum set to 70 seconds and seal and cooling to 0 seconds respectively. The unit already comes with high-quality bags that are as cheap as 5p per bag if bought in bulk and can save you a bundle over time. So it’s smarter to use the recommended bags! You can also utilize the VacMaster for both households and commercial needs. Because it is highly productive, however, unless your home has such extreme storage needs, using the VacMaster for the house is overkill. During sealing, the product tends to heat up. In the case of liquid or semi-liquid foods especially, the heated product may travel to the open end, causing a failed seal. Avoid over-filling. While putting in the contents, leave at least 3 inches of space between the product and the open end. To be extra careful, use a small, wooden bar to create an elevation between the sealing end and the product, to stop the contents from moving up. VacMaster pouches can be boiled, frozen and microwaved. Make a small cut in the packet before microwaving; that is all you have to remember. The VacMaster has become the go-to solution for all my bulk storage needs! Well-constructed, fast, and quiet, it provides consistently superior performance, rendering it perfect for hoarders and small commercial users like me. NOTHING compares to its durable seals, for both solid and high moisture foods, and the powerful oil pump works for hours without overheating. Uncomplicated oil-changing and excellent user-controls are definite pluses! If you want fresh, scent-free contents for years, the Vacmastervp215 is where your search ends. Even if it lies on the higher end of the price line, it practically pays for itself with its benefits. And honestly, you have to experience it, to believe it!